Put your english muffin in the toaster to the darkness you prefer. The Thomas light multi-grain muffins are my favorite! You want to find a small container about the width of your muffin. I generally use a ramekin. Spray your container with non-stick spray or use your preferred method for greasing the dish. Crack your egg in the container and lightly scramble. Add a little bit of pepper. Then, cook your egg for 45 seconds. If it needs to be cooked longer, add time in 10 second increments. 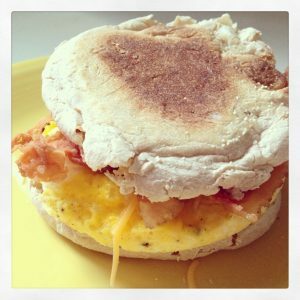 As soon as the egg is done, I place the egg on the muffin and add a little bit of shredded cheese on top so it will melt a little. Add your preferred toppings, such as deli ham, bacon, and sausage.